Crude oil prices gained bid during yesterday's session after the weekly report published by the American Petroleum Institute showed a surprise draw in crude stocks. Inventories fell by 998,000 barrels in the week to Feb. 8 to 447.2 million, compared with analysts' expectations for an increase of 2.7 million barrels. OPEC's monthly revealed that the Crude oil output in January decreased 800,000 barrels per day to 30.81 million barrels per day and provided the initial boost to Crude prices. Optimism surrounding the U.S.-China trade talks supported the black gold's daily rally. Today the focus will be on the EIA report. 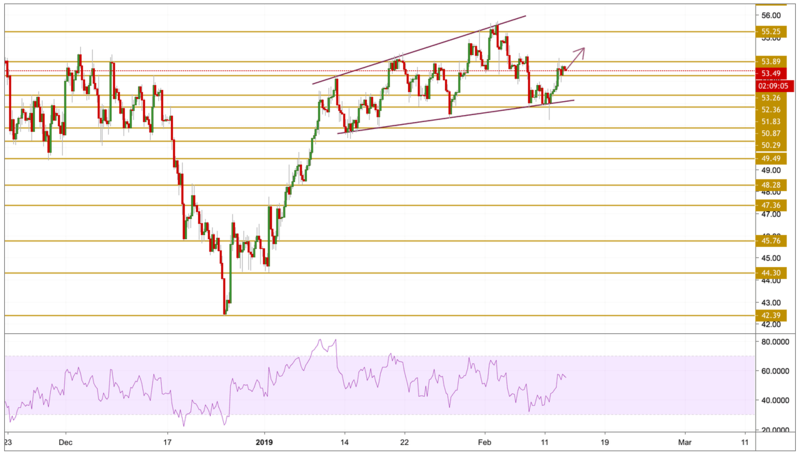 Crude oil prices gained traction as expected and rallied above the $53 level after receiving strong support from the lower band presented on the chart. The price is currently hovering below the $53.89 resistance level consolidating with a stronger momentum. A breakout above this level will open the way for a retest of the $55 level.